I’m a sucker for a chocolate cake and so it seemed the perfect place for me to dive into Robin’s newest book. This one caught my eye for another reason as well, it is vegan. No, I’m not a vegan, but I’ve been looking for this very recipe since the day my brother and his girlfriend announced to the family that they were. I’d been experimenting with vegan cakes to serve them, but honestly I hadn’t gotten very far. I’m too wedded to butter, eggs and cream. Robin came to the rescue. I gave the recipe a test run for Katherine’s (before mentioned girlfriend of my brother) Birthday. Truth be told I never actually gave them to Katherine, not for lack of desire, but because they are in Copenhagen at the Climate Change March, where they are preparing to display their artwork to affect change in the world. What a memorable birthday she will have and I will gladly make these cupcakes again once she returns, a perfect way to celebrate. Robin manages to achieve a rich chocolate cake with a moist (but not dense) crumb without the benefit of eggs or dairy, mystifying! The filling is remarkably reminiscent of mocha pastry cream and the ganache is chocolaty and glossy. It all defies classic baking and yet it works wonderfully. 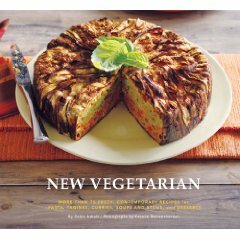 As a gift to you Robin has signed a copy of New Vegetarian for me to give away. Just leave a comment below and I will pick a winner next week. 1/4 cup Agave Nectar~ the sweet nectar from the agave plant, which is what they also use to make tequila. You can substitute honey if you can’t find it ~ (although honey may not be suitable for vegans, in which case maple syrup is a better choice). Melt the chocolate, agave and coffee powder over a double boiler until perfectly smooth. Set aside. until perfectly smooth. You will need to scrape the sides down with a rubber spatula. process until smooth and thick. It will look like chocolate pudding. Set aside while you bake the cake. Preheat oven to 350 degrees and line 12 muffin tins with papers. In a large bowl, whisk the flour, cocoa, baking powder, baking soda and salt. 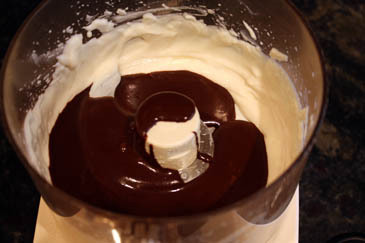 Melt the chocolate and oil in a medium sized bowl over a double boiler until perfectly smooth. 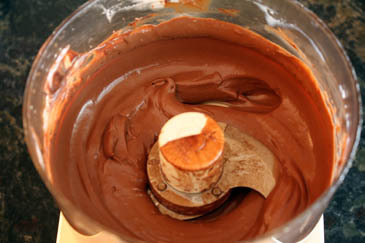 Whisk the agave into the chocolate mixture. In a third bowl whisk together the soy milk, vanilla, vinegar and Kahlua, then stir it into the chocolate mixture. 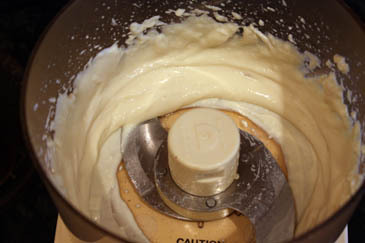 gently whisk the wet mixture into the dry. 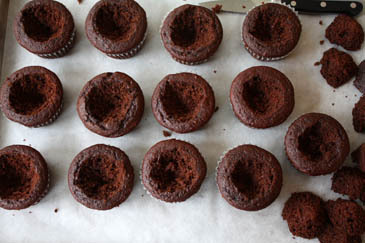 Divide the batter into the muffin cups and bake for about 18 minutes or until the tester comes out clean. Cool them for 15 minutes before removing from pan. to make a space for the filling. 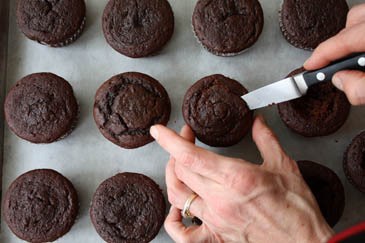 Don’t cut too much away or the cupcake may not have enough structure and fall apart. 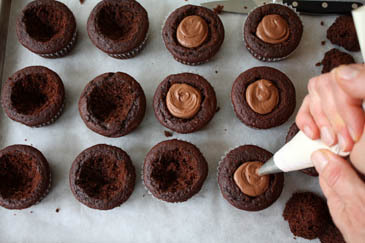 Use a pastry bag with a round tip to fill the cupcakes with the mocha filling. Melt the chocolate and soy milk over a double boiler until smooth. Gently stir in the Kahlua. 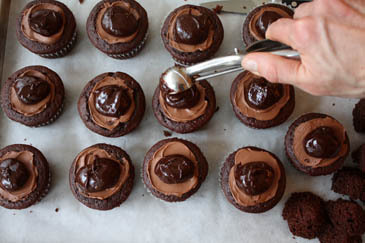 Spoon the ganache over the top of the cupcakes. 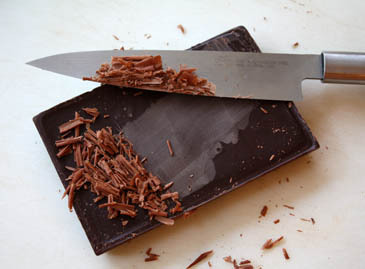 Using a chef’s knife, scrape the smooth side of a bar of bittersweet chocolate to create the shavings. sprinkle the shavings over the top of the cupcakes. For another recipe by Robin check out this amazing apple pumpkin cake I made from her first book The New Whole Grain Cookbook: Terrific Recipes Using Farro, Quinoa, Brown Rice, Barley, and Many Other Delicious and Nutritious Grains . Our wedding cake was a vegan chocolate cake…ah the looks we got that day. This looks delicious will try it soon. They look lovely!! This cookbook has totally piqued my interest! Family members with dairy allergies. This would prove to be a great resource! It is a syrup that is extracted from the agave plant, some one that they use to make tequila! You can replace it with honey. I just can’t handle even looking at those cupcakes now. Tomorrow. After a big lunch. Hope the giveaway is open to Canadians! Lovely cupcakes, Zoe! I eat mostly vegetarian and love the creativity of many vegan recipes, including a cookbook of fantastic vegan cupcakes. This would be a great addition to my collection for sure. Today’s my birthday and I’m not vegan either but can I have one please.. or maybe two?? Btw, if Swee San uses honey, the cupcakes won’t be vegan because honey is an animal product. But the cupcakes will be much as good!! Can I have one?? Looks intensely good. I’m not vegan, but I don’t mind the odd vegan treat, and these cupcakes have my name all over it, I think! Thanks for sharing, Zoë! PS: And the cover of Robin’s book looks mouth-watering as well! Good to have a vegan recipe just in case! Though I am pretty sure I’m for the eggs, butter, and cream. wow these cupcakes look delicious. i’ve experimented with vegan cupcakes and have definitely had trouble with texture and flavor…but these look divine. i’d love this cookbook! Looks delicious! Always nice to have really good vegan recipes – for baked goods especially! Those look so yummy! You could fool anyone with these cupcakes, they’d never know they were vegan! I think that’s the best part about cooking vegan and even vegetarian. I like when you can take an ingredient like tofu—that a lot of people would cringe even hearing you utter the word, and prepare it in a way that not only do they like it, but they think it is something entirely different. It looks like this is a recipe that would succeed with my family! Mmmm, those look amazing! I’m trying to expand my vegan cooking repertoire, so recipes like this are always prized by me. I’m not a vegan, but this book could come handy to make stuff for those that are! I’m not vegetarian either but we are trying to eat less animal product. This recipe book would certainly help us achieve that goal! Looks decadent, even without butter. I believe I’ll try them. Thanks for all the kind comments-good luck in the contest! I just want to reach out to your page and grab one to eat. Grand looking cupcakes. I have been an advocate for vegan cakes for some time. Not the fake kind that use that awful “earth balance” stuff, but real ones like this. The nice thing about a tofu-based icing is that you can have a strong chocolate flavor and rich taste without feeling like you’re being killed by a stick of butter. Thank you for posting this recipe! I am always looking for new veg options and, although we are not vegan, these cupcakes look delish! I’m vegetarian, not vegan, but those look so delicious I’ll give them a try! I’m just leaning vegetarian and would love a new cookbook for some guidance. WOW! Those cakes look amazing! I bet they are delicious with the Kahlua. Thanks Zoe! We host “family coffee” every Tuesday morning at our house. Friends who are ome with kiddos (and some without) know we will have hot coffee. Everyone brings treats to share. We currently have a friend who has had to drastically change her already vegetarian diet to accommodate her nursing baby’s allergies. Vegan chocolate cupcakes are going to THRILL her! The book should give me lots more ideas so she is included in the treat consumption. Thanks for sharing! Those cupcakes look yummy! This is perfect timing..my friend can no longer have any dairy and she LOVES cupcakes. Thanks for this post about the cookbook. They look delicious! I will have to try making this recipe. A great friend of mine is vegan and she’d love a new cook book! Well…I’d love her to cook me things, too, but still! Wow, i’m soo making these this weekend! Oh, these cupcakes look fantastic! I have yet to bake with silken tofu, but I’ve heard the results are good. I can’t wait to try it! Thanks for sharing! These look amazing! I’m vegetarian, but I have a close friend who is allergic to eggs. I’m always looking for fun and yummy recipes to make for her. I may just have to try these for her birthday. Wonderful,many of my sons friends have egg and dairy allergies this is perfect. these are some amazing looking vegan cupcakes! I’ve been baking from “Vegan Cupcakes Take Over the World” for vegan friends. It’s been mostly good, but I can’t wait to try these! Wow. Those look and sound absolutely delicious. I’ve yet to venture into vegan baking myself, but have been the lucky recipient of homemade vegan cupcakes from friends. I really should return the favor! Wow! These look amazing! I’m intrigued by the cover image too. These will be perfect for my son over the holidays. You might also want to try the vegan oatmeal cookies in Vegan With a Vengeance by Isa Chandra Moskowitz. Perfect for everyone! I’m not a vegan either, but did some vegan baking for a coffee house I worked at – the Moosewood Daily has a really good vegan chocolate cake recipe that I use. I top it with the Joy of Cooking’s peanut butter cream cheese frosting, but substitute Tofutti for the cream cheese – you can’t even tell the difference. Wow! These look amazing. I have made chocolate mousse with the silken tofu before, and vegan chocolate cake (I also like the Moosewood recipe), but I have never thought to combine vegan ganache, mousse, and cake all together like this. Wow, those look absolutely amazing! Sounds like a great recipe. Would love the book. Thanks for sharing. I’ve been trying to cook more veg meals and this would be perfect! Those cupcakes look incredible! Those look great. I’m always looking for chocolate desert recipes that don’t use dairy since I’m lactose intolerant. These look delicious! Do you think the recipe would work as a layer cake too? These look beautiful. I have gone to cooking classes taught by Robin and find her ideas to be creative and very tasty. Thanks for sharing this recipe here. Oh my, that makes my mouth water! I recently turned vegan but am a passionate baker! I am having trouble resisting my own creations so I love finding tried and true vegan recipes. Thanks for posting this! Also, I hope the cutout of the cupcake doesn’t go to waste! Oh Yippy! Finally a vegan chocolate dake that is delicious. We’ve been trying to be vegan as my toddler is severly allergic to eggs and dairy (it took 2 years and 23 doctors to figure out why he was so sick). Being vegan has changed our lives and we miss all our favorites. I can’t wait to try good tasting and good textured vegan baked goods. I am so excited because I will be receiving you new book HBin5 in just a few days! I came upon your book by accident and your wonderful blog too. I can’t wait to try the bread recipes, I’m intimidated by bread making for some reason…I love to bake cakes, cookies, pies, and all sorts of yummy goodies, but I admit bread making scares me. 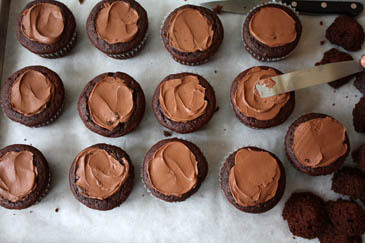 So, I’ll try making these beautiful chocolate cupcakes this week while I await your book to arrive in the mail. 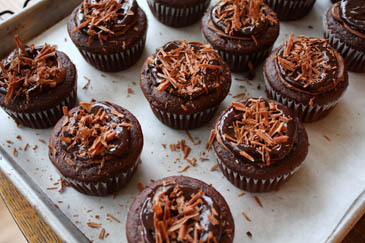 Yummmm…love vegan baking…gotta try these! Those are beautiful! And I bet they’re amazing with all the agave nectar (my fav sweetener ever). My boyfriend loves chocolate but is lactose-intolerant; I can’t wait to surprise him with these!! Thank You! the nine lives of tofu! amazing. these look yummmmy. Oh your cupcakes look really good and I would luv to win a copy of the cookbook…what a nice giveaway! Zoe. Honey is nit vegan. Many vegans hold that honey is as much a stolen prodect as milk. Im sure it’ll work in the recipe but don’t make the mistake of telling vegans it is vegan if you substitute. As a dairy-loving pastry chef, I’m always skeptical of vegan desserts, but these actually look good. I’d really love to know what’s on the cover of the book – it looks beautiful! Thanks for all the great blogging, Zoe! I’m not a vegan but I do incorporate lots of vegetarian meals in our diet. I would be thrilled to win the book give-away. 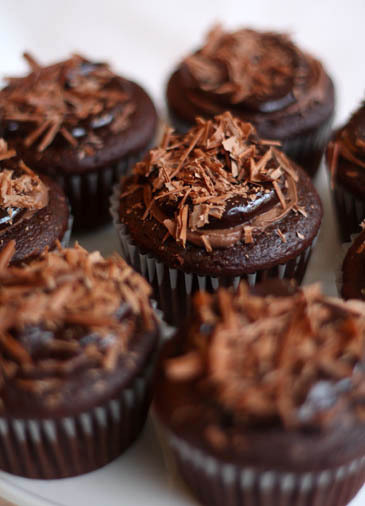 I have been a big fan of your Devil’s Food Cupcakes and would love to try these. I already have the necessary ingredients in my cupboard. I can’t wait to make these for my Nephew who is a vegetarian. I have some great soup and stew recipes but not many desserts. Thanks for straightening me out on the honey! Makes sense now that you point it out! I added a disclaimer to the post so people know not to use it if making for vegans. I love your website and all your creations. You are so talented. I have been eliminating animal products from my diet which is very challenging because I already have Celiac disease and cook gluten-free. This cookbook looks appealing to me. Today I bought your Healthy Bread in Five Minutes a Day. I was so thrilled to find a chapter on gluten-free baking. Yesterday I was searching for a gluten-free brioche recipe and was shocked to find yours. You eliminated some trial and error for me. Question. In your previous book you state that brioche should only be made with butter, never oil. I agree. However, in the gf recipe you used oil. Why? Did you test it with butter? Thank you for your attention to our gluten-free needs. I was skeptical when I saw the tofu because I’d much rather fill them with cream cheese, but the finished product looks so good and the flavors sound wonderful together. Curious as to what you did with the cake portions you cut out? Hi Zoe, thanks for the answer.. I will try to make them with manuka honey tonight.. I hope it turns out well for the picnic tomorrow morning! Vegan and Agave, I am sold! I will have to try these for my grandfather’s birthday this weekend. My future daughter in-law is vegetarian and I feel like I’m learning to cook all over again. I must admit it is fun. I would love to win this book and try some recipes that would light up her eyes. They look great and I’d really like to try these ingredients that are totally new for me. Thank you so much for posting this recipe! I’ve been looking for a good recipe that didn’t include any dairy for a lactose intolerant little boy. This is perfect. Delightful! I’m pretty devoted to savory things but wouldn’t hesitate to make these for my sweet-loving family members! The New Vegetarian looks like a winner! That is some awesome cupcake! I will definitely try it, as we are in the “transition” stage of eliminating all the bad foods, and adding the good. Thanks, Zoe. These look good enough to encourage me to try baking vegan with tofu!! This sounds fabulous! I love the idea of using soy or coconut milk. You do such a good job showing the steps. I don’t usually make cakes or cupcakes…but this one I will! Thanks! holy smokes! How have I lived without this book? Thanks for the wonderful recipe! I will have to give a copy to my niece who is always looking for yummy vegetarian recipes! Wow, beautiful pics of cupcakes! I can think of many ways to adjust these cupcakes to what ingredients I eat most. I’m very curious to see this cookbook. This book looks like it combines two of my favorite things.. delicious recipes and health conscious thinking. The recipe you provided adds one more item.. chocolate! My boyfriend recently became a vegan and I am a baking addict. The neighbors have been happy with this since I’ve been giving all my goodies away, but this looks great for both of us. I’ve been able to do cookies by substituting coconut oil and ground flax seeds for butter and eggs, but cakes haven’t worked out so well for me yet. I will definately try these this weekend! These look like fun to make, and delicious too! Thanks for sharing. I have been a vegetarian all my life and love the vegan cupcakes. They will truly melt in your mouth. My daughter has severe allergies and I bake vegan recipes for her. This looks like a great book for us! I must make these. The look scrumptious. I love the cover of the cookbook. I am trying to figure out what the insides are. Pretty, whatever they are. I must make these. They look scrumptious. These look delicious and I would love to have the vegetarian cookbook for my daughter! This sounds and looks delicious; so hard to find really good vegan baked goods recipes. Looking forward to checking out the book! The cupcakes look fantastic. I had to give up all dairy and eggs, so I would love the book!! Oh and I’m making your vermont cheddar bread today! looks delicious! I just saw that book a few days ago and thought it looked pretty good! My daughter is a new vegetarian. I’ll have to check out this book. It looks great! Also, just want you to know I LOVE the new bread book! This looks delicious! I like the step-by-step photos! I don’t need to read the directions. Thanks! Oh now you’ve done it. 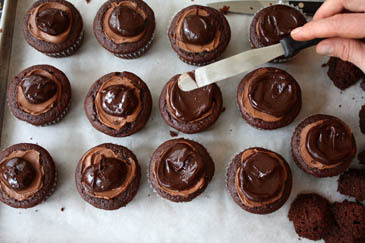 It’s 10:10 pm, I’m in my pjs, and I’m craving chocolate cupcakes! I’m not a vegan or even a vegetarian but would like to win the ckbk because if I can make healthier desserts that taste as good as those cupcakes look, then all the better! I am not a vegetarian but I like to try different ways of cooking and eating. This is a great recipe and looks very delicious. I will try it soon. I would love to have a copy of this book. Love the new book on bread! Divine! I’m not (currently) vegan in my eating habits, but have “accidentally” discovered the deliciousness of vegan baked goods through the good graces of lovely markets such as Lakewinds Coop and Whole Foods. Can’t wait to try more recipes from this tempting book! ooh yum. I know a lot of people who would looove this (including ME). Those cupcakes should be illegal. My thighs are expanding just looking at them. These look unbelievably good and I can’t wait to try the recipe! Zoe, your blog is actually the only “non-vegan” cooking blog that I follow (the ‘Artisan Bread in 5’ has made my family SO happy! ), so imagine my delight when I saw the word “vegan” pop up on your blog! Thank you so much for crossing over, even momentarily! What a gorgeous cupcake recipe! I cannot wait to try these–they’ll be perfect for Christmas. Thanks for the chance to win the book–and even if I don’t, I’ll be checking the book out, for sure! Wow….Who would have ever guessed. I love sneaking veg. recipes by the cowboy every once in a while to show him that meat isn’t absolutely essential at every meal and snack!!! Hmmm. He’s still convinced that a little bacon makes anything taste better! my family and I are trying to eat more vegetarian and less meat. This recipe looks great! ZOE! I just woke up from my afternoon nap,and good lord! What am I seeing? It look so mighty delicious! I am sure Robin’s book is a winner! The cover page definately tells me so! Hopefully, the silken tofu flavor doesn’t come out too strong. That’s always my problem with tofu in desserts. Thank you so much for this! I have two vegan friends for whom I’m often at a loss to bake. These will definitely be a big hit!! Zoe, this recipe looks delicious. I’ll share this with my mother in law who would love this book, thanks for the chance. I can’t wait to make these cookies… they look delish! wow, tofu in a cake! perfect! Wow, those look great – and vegan too. Very cool. These look yummy, can’t wait to make these. Also, I hope I’m not too late for the give away. Hi!! I am not vegan but I am allergic to dairy and have learned that vegan recipes suit me well … =) Thank you for such a yummy looking recipe! Wow, these look amazing. I have been trying to convince my kids and husband that we don’t need to have meat/poultry at most meals, and this looks like the perfect book! looks awesome. so what do you do with the part you cut off? always looking to not waste any chocolate!! That is the chef’s treat or what you hand to the kids when they want to taste the cupcakes before they are ready! You could also use them in a trifle. Never any waste! These look so delicious. My nephew is vegan so we are always looking for ways to keep him in the loop of treats, especially around the holidays. Thanks for sharing this special recipe and the book it comes from! I will update you once I have gotten a chance to make them myself. I used to work with a large group of Indian programmers and baking for the friends on the strictest diet was a challenge. I wish this book had been out then. I made do with Egg Replacer which was better than nothing. The cupcakes look delicious and vegan to boot. I have just recently discovered your site, but have been using your 5 minutes a day recipes for a few years. I can totally relate! As a pastry chef, I can’t really embrace exclusionary diets (and thank God I don’t have any medical restrictions that force me to) but my son is a vegetarian and I have several friends who eat “paleo” ~ no grains, sugars, dairy, or processed foods. It’s a constant challenge to adapt recipes to meet their needs, but we do love a challenge, don’t we?! Thanks for your story, and for your lovely pictures! I mostly cook vegan although I do eat fish sometimes, so I would love to win the veg cookbook! Unrelated to your post, thank you for the healthy bread in 5 minutes book. I really appreciate it. Made my 2nd loaf today and it is wonderful. Oh my goodness. I cannot wait to make these! i took the cupcake tops and made my own oreos with them. two tops and the cream in the middle, i also added some coconut. kids loved it. That sounds amazing! My kids are going to love this! These cupcakes look fantastic and it looks like Robin has found a great way around the dryness issue that plagues vegan baked-goods by using BOTH tofu and soy/coconut milk. I do hope you will be featuring more recipes from this book! I would love to win a copy–it would be a real treat for our Vegetarian household to have some new recipes, and also a cookbook that would be “cover-to-cover usable” for us! I was wondering whether these cupcakes would work as a sheet/layer cake with the mocha filling as frosting? Would the texture of the mocha tofu filling hold up? I’ll give it a go tomorrow, but thought I’d just put it out there! Thanks! I’d love to know how your experiment went, sounds great! 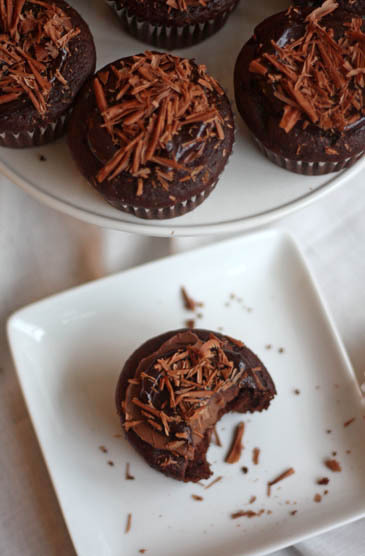 Love the triple chocolate cup cake vegan dessert! Yum, yum! I’ll have to try this sometime. Wow…those look absolutely gorgeous and yummy. Will have to try. These cupcakes look too good for words! As a vegan college student with a couple of very hungry roommates, I am always looking for some great recipes to test out on them, and this one looks like it will surely be a hit! Really great photos! I will definitely be making this recipe. Thanks! I was very excited to try this recipe, but it failed on me twice. I double and triple checked all of the ingredients – the only thing I substituted was honey for agave nectar because I’m not strictly vegan, balsamic vinegar for rice vinegar, and extra vanilla extract instead of alcohol. but I followed all of the other instructions to a tee. The cupcakes collapsed basically into what looked like cupcake liners. On top of that, the mocha filling was completely runny. I drained the tofu and patted it dry with paper towel, and even tried adding more to thicken it up. It was still completely liquid – not thick and fluffy at all. Any idea as to why every single thing went wrong? What kind of flour are you using and how are you measuring it? I used scoop and sweep for measuring the flour, which will result more per cup than spooning the flour into the measuring cup. Do you have an oven thermometer? 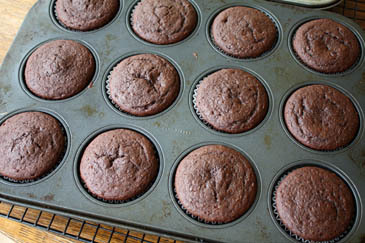 Your cupcakes may also be underbaked, which is often a result of oven temperatures being off. Was your tofu chilled or at room temperature. 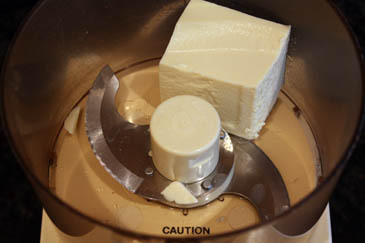 If the tofu is not chilled it may not set up the chocolate and become thick. You can try sticking the filling in the refrigerator and see if it thickens up. Yes, almond flour is the culprit. You can’t switch almond flour for regular all-purpose, since almond flour has no gluten and will have no strength or structure to hold up the cakes. Try it again with all-purpose and you’ll have success. Thank you Zoë! I’ll try them again soon. wait a minute. All-purpose flour??? in the recipe? where??? how much does it take? I am very confused. Chocolate covered Coffee Toffee and my Birthday Cake! Chiffon Cake with a Tuscan Twist!